Transnet would regularly make huge payments to questionable companies owned by the Gupta associate, Ian Sinton testified. 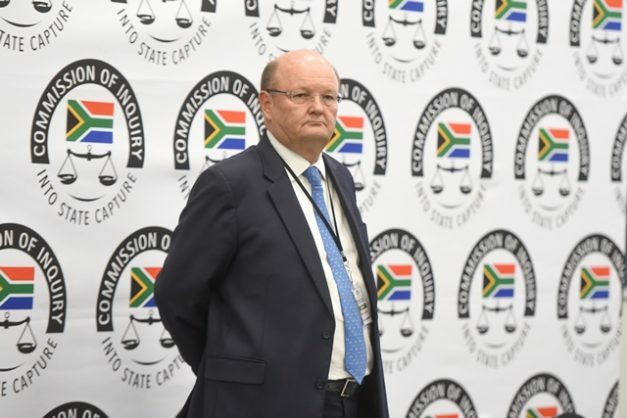 Gupta business associate Salim Essa, who received the lion’s share of the Regiments Capital revenue flowing from the questionable McKinsey-Transnet R600 million deal, was awarded 30% in introductory consultancy fees, the Commission of Inquiry into State Capture heard yesterday. Funds in Standard Bank’s Regiments Capital’s account, deposited by Transnet to Chivita Trading, Homix – among the questionable companies owned by Essa – would be withdrawn the following day. Gupta-owned Oakbay requested the bank to transfer R1.7 billion from the mine rehabilitation trust to the Bank of Baroda – immediately after assuming ownership of former Glencore-owned Optimum Mine – a request which was denied. Adverse media publicity led to Standard Bank taking a decision to close Regiments Capital’s accounts. According to Sinton, Regiments Capital’s accounts were terminated by Standard Bank in 2017 after the financial institution raised concerns after scrutinising a string of dubious transactions from 2014. Seventeen accounts, depicting transactional cash flows in May 2014 alone, saw an amount of R20 million being paid to Chivita and another R20 million by Regiments Capital, totalling R40 million in two days. Records also showed that on May 5, another R5 million was paid into the same account – pushing the amount to R45 million, with R2 million regularly being paid to two directors. A similar trend was a regular occurrence, at times leaving the Regiments Capital account, which served as a conduit, in the negative. Sinton, whose evidence implicates 19 individuals, said out of the Transnet deal, the breakdown was McKinsey 70/30 with Regiments Capital – with Essa getting 30% of Regiments’ 30%. “We began to raise concerns in the light of adverse media reports on Regiments Capital on alleged Gupta-linked corruption at Transnet and started to scrutinise transactions which looked out of the ordinary, with large unexplained amounts of money coming in and out,” said Sinton. Sinton said the bank resolved to close Regiments Capital’s and Gupta-linked accounts, also terminating the bank’s relationship with international management consulting company McKinsey. Compelled by the provisions of the Banking Act and the Financial Intelligence Centre (FIC), among a maze of instruments governing financial banking transactions, Sinton said “the bank’s risk management policy led us to report these transactions to the FIC”. “As a bank, we are also highly regulated, with shareholders who invest in our bank always watching our conduct and employees raising concerns on reputational issues,” said Sinton. Former business rescue practitioner of Optimum Coal Mine, Piers Marsden, is today expected to shed light on efforts to save the financially struggling Glencore-owned mine, which was eventually sold to Gupta-owned Tegeta.